Affordable Accoutrements: Thrift Meets Limoges, with Bunnies! The dinner plates and demitasse cups & saucers are pre-WWII. The plates are Turin (Bavarian), and the cups are Tressemane & Vogt (T&V, Limoges, France). I purchased them a few years ago at the estate sale of a retired physician/antiques collector. The salad plates were a thrifty find -- six for $4 at a local charity thrift shop. There's no backstamp, so I don't know the maker or pattern. The gold rims are a bit worn. Still, with their stylized floral pattern (accented with a butterfly), I think the plates seem fresh and appealing. The little ceramic bunnies are also thrifted. The contemporary glass napkin ring has a cylinder that acts as a vase (for fresh flowers or silk). I inserted yellow "Carefree Sunshine" no-spray rose buds. I also used the yellow roses in the centerpiece, along with pinkish-red no-spray roses and azalea cuttings. I kept the arrangements low, but added a bit of height to the one in the middle by placing a footed bon-bon dish on the shell-shaped silverplated tray. The other containers are silverplated gravy boats, a bread tray, and the base of a covered vegetable dish. I used small pieces of water-soaked oasis (in all but the center tray) to anchor the azalea cuttings. The azaleas provide a structure to hold the short stems of the roses in place. There's enough water in the shallow containers to keep the flowers fresh for at least a day or two. A closer view of the demitasse cup & saucer. The stemware and candleholders are Fostoria's classic "American" pattern (1915-82). It's easy to see how "American" remained popular for so many decades. The faceted design captures and reflects light and color beautifully. The silverplated flatware is "Eternally Yours," (1941-73). 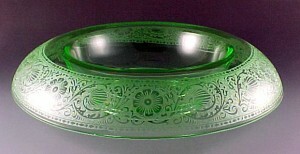 The pattern was produced by 1847 Rogers Bros., a division of the International Silver Company. I used my favorite set of salt & pepper shakers today. They're by Mikasa. Speaking of Mikasa, I just won six place settings of Mikasa's "Daylight" china in a giveaway hosted by Marlis of Creative Journeys! You can read about it HERE. Marlis has set a truly gorgeous Easter table with her own Daylight china HERE! Nicely done! 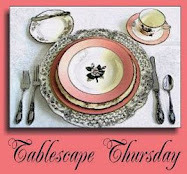 Thank you Marlis, Mikasa, and, as always, thank you to Susan of Between Naps on the Porch for hosting Tablescape Thursdays. Please visit Susan and all talented participants. I hope you have a very Happy Easter! Happy Easter to you and your family dear Bill! Another beautiful table. I have those napkin rings and just love the versatility. I am slowly but surely gathering more of the American pattern and I like the way it goes with hobnail. I hope you and yours have a wonderful Easter weekend and if your table is any indication, it will be splendid. Hi Bill! Oh, what a gorgeous Easter table you've set. Love your dishes, thrifted bunnies, silverware, Fostoria - I have some of this pattern and just love it! :) But...I must say, as beautifully as you put together your floral centerpieces, this is my favorite! I just love the flowers you've used and the sweet colors. Just an aww moment! What a table, Bill! Breathtaking....I love seeing the wood surface surrounding all the beautiful dishes, stemware, silver pieces. Your centerpiece is so lovely. Happy Easter to you and yours, xo P.S. I am a new follower! So pretty! I really like the roses mixed in with the azaleas. Congratulations on winning the china. Hope you did not have any storm damage last night. You are just so sweet!!! Thanks for the mention. Mikasa did say they would sneak me into the boxes so that I could sit at your luscious tables! (Just teasing)... I love how the flowers on the table augment the flowers on the plates. How beautiful these look together. Your form of your cups is so amazingly gracious and timely. What a lovely setting. Your bunnies do add the bit of unexpected and will do nothing but make your guests feel pampered and they will smile with delight! A great table Bill. congrats again on winning the Mikasa dishes, you will astound us with a beautiful table when they arrive! Gorgeous and so delightful for Easter. The bunnies had me at hello! And they love having their picture taken. Everything looks wonderful, but I always choose a favorite thing...those elegant Mikasa s&p shakers are beautiful. And the bunnies of course. And the napkin rings..
Oh, I can't decide. All lovely! I am struck with the colors of this gorgeous spring table. The aubergine and coral with the touches of yellow are striking yet work together to create a soft look. Your gardens must be magnificent right now! The bunnies are sweet but the table does not take on a cute feel because of the serious silver, lovely fostoria and always timeless limoges. Another brilliant table, my friend! Congrats on winning the Mikasa! I hope to see it on a table soon. Congratulations on finally winning a give-away, Bill!!! LOL Cuisine Kathleen must have broken the spell. Oh how I wish I had some flowers blooming so I could use them. We're still cold & rainy up here. Have a very Happy Easter, my friend! Your "thrifty" finds are treasures indeed! Beautiful table as always and your flower arrangements capture Spring perfectly! And you said you never win anything. Congratulations on your pretty new dishes!!! Beautiful as always Bill!! Happy Easter too! Love the table, love the glasses, love the napkin rings and most of all love the buunies. And yet another great week at Bill's house. I love the way you mixed the thrifted with the more vintage pieces and made it all look wonderful. The flowers steal the show this week to me. They're just beautiful, and tucking the bud in with the napkins was a perfect touch. The florals are so pretty. I couldn't take my eyes off them and I bet they smelled wonderful. My orange azaleas are so fragrant. Bill, you don't seem to ever run out of fresh ideas. This table is wonderful. I like the mix! Those crystal napkin ring holders with the roses are a nice contrast to the vintage plates. Stunningly beautiful table as always, Bill. Pretty and soft tablescape! Yes, it's fresh and whimsical! The little bunnies were so cute, especially the one with the closing eyes. And love your floral arrangements -- as I always say: you're the master! P.S. Have a wonderful Easter! I love this, Bill! The chinoiserie china pattern is wonderful, and those cute bunnies are the perfect spring/Easter accessory. I love the way he is looking over his shoulder with that winsome expression. He reminds me of Thumper. Your flowers are perfect as usual, and I really love that Fostoria pattern. My grandmother had a similar one, and seeing this reminds me of going to her house as a child. Not sure who has it now. Either one of the nieces or one of the other grands. As always, you are on the top of your game! I'm headed out the door to antique club, and I plan to do my blog visiting later. But I just wanted to come by and see what special treat you had for us this week, and you didn't disappoint! You get an A+! P.S. I love the color of your living room! Adelaide's LR and DR are a similar shade, and I think it's just gorgeous! So elegant and colorful. The centerpieces are so pretty. Very nice! I came back by to take another look, Bill, when I wasn't so harried, and I'm glad I did! Just gorgeous! Hi there, Bill! Sooooooooooooo pretty! I like the bunny with his eyes closed the best. I'm not sure if he's sleeping, shy or just a sneaky little character! At any rate, he's a keeper! I am a sucker for every element on your table today. The china is magnificent, and that flatware...oh...my....gosh!!!!! It's what they eat with in heaven, I'm sure! The design is vaguely reminiscent of International Silver Company's "Royal Danish" sterling. If you ever some across an excellent buy on that and don't want it for yourself, PLEASE let me know. Call me, email me, send smoke signals....I don't care, dude. Just LET ME KNOW!!! Hold on. Where are my manners. Let me know PLEASE!!! :-) Last but not least, I guess that you, Marlis and I are now joined at the "Daylight" hip! I am honored to be in your fine company, good sir! I hope you have a wonderful Easter weekend. Take good care! Bill...this is really gorgeous! Cute bunnies and they have the same coloring in their design as your beauitful china...love the sleepy one and your flower arrangements are so happy and charming I would love to own a flatware as elegant as yours! Everything is excusite as always dear Bill. Hope you come by and visit. Wishing you a very blessed Easter. Bill...this is a lovely table. Your floral arrangements are gorgeous;the colors amazing. The dishes are so pretty and those bunnies are so sweet! You always find such amazingly beautiful things! You;ve done it again Bill! Happy Easter! This is exquisite. I love the candlestands - so unusual. Actually for me, the first time I have seen this in glass. Love the colors of those beautiful flowers, an awesome centerpiece! So sweet little bunnies! As usual a fantastic setting! Bill, your floral arrangements never cease to amaze me. They are so lush and gorgeous, and I'm so impressed that your garden supplies such wonderful "resources"! I especially like this color combination. Ok! I'm back to tell you I adore your gorgeous Fostoria Crystal candle holders...gosh, I just love them! I don't like much the big kind of voluminous type of candle holders, I really adore this ones!....that's it, just wanted to comment on this beauties! Your azalea and rose flower arrangements are so pretty. Your flowers are always beautifully arranged. And I love your choice of purple candles. That seems very appropriate for Easter. Now about the dishes. They are so very elegant, and I've taken a real fancy to the salad plates with the lovely floral pattern and, of course, the butterfly. I also love the pretty flatware pattern! Since you are so knowledgeable about glassware; do you think this Fostoria pattern is the same as my little vase in last week's post? It looks very similar, but I just can't tell for sure. Once again, you've done a lovely table, Bill. Happy Easter to you! I really do love looking at your florals as much as I love the table setting. I love how you kept the flowers low and how they seem to spread out onto the table. The napkin rings with the "vase" are so unique! I think the table is very elegant and the cute little bunnies add just the perfect touch of fun and whimsey. Congrats on the win...how fun for you! Lovely and elegant as always Love your floral arrangments. You know I love those yellow roses! The napkins rings are wonderful! Bill, have a wonderful Easter celebration! You've succeeded again in creating a lovely table with bunnies without going "cutesy." Just lovely. your table is very charming. I really love the flower decoration, that looks so gracious against the dark table. 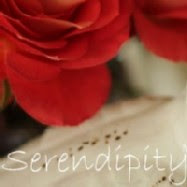 Again, I find a fabulous table within your blog. The centerpiece is a sight to behold! Congratulations on your big win!! How exciting that must have been. Just stunning...The napkin rings are so unique and the flowers are beautiful! Your entire table is delightful! Ever piece picked out carefully and placed so well. I love the bunnies and I think they are a perfect touch! The plates are beautiful and the demitasse cups so lovely with the gold band. I love the napkin rings too, I have not seen any like that before. Thank you so much for showing us your beautiful tablescape! Wow...what a gorgeous tablescape...love the china and the flowers are simply stunning!! Há poucos dias descobri seu blog e fiquei encantada com o seu trabalho e o seu bom gosto em decoração. Sou de São Paulo - Capital - Brasil e apaixonada por tudo o que é para decoração e paisagismo. A composição de suas mesas são maravilhosas. Eu fiquei deslumbrada. Parabéns. Parabéns ! Espero poder continuar apreciando dia-a-dia novos trabalhos. Há poucos dias, descobri seu blog e fiquei encantada com suas mesas e a qualidade de seu trabalho. Sou de São Paulo-Capital - Brasil e apaixonada por tudo que é para Decoração e Paisagismo. Parabéns, Parabéns pelo seu extremo bom gosto. Espero poder continuar apreciando a composição de suas mesas no dia-a-dia. Hey Bill -- I've been missing you! Hope all is well and you're just busy.